A mild pork and veal sausage forcemeat usually made into sausage links. Most often found fresh and uncooked. 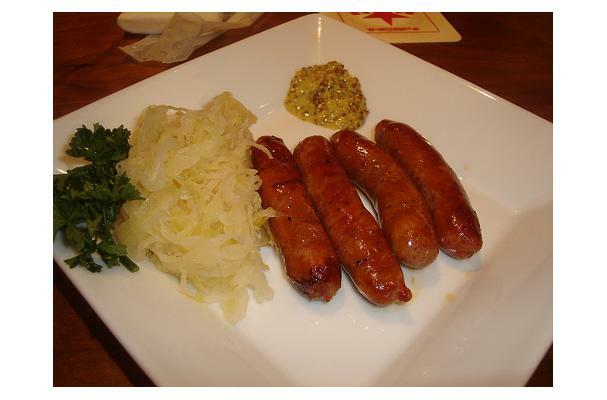 Bratwurst is a favorite German style sausage that is commonly served with spicy mustard and slow cooked sauerkraut. I think you mean "Bratwurst". There are many different kinds of "Bratwurst" in Germany, Austria and Switzerland. Depending on the region they are spiced differently. A favorite for many in Bavaria are the "Nuernberger Bratwurst" which is a bit thinner than the regular "Brat" and cooks faster. You're absolutely right! Not sure how that got by me. Excellent catch. Since this is the cooking encyclopedia that everyone can edit, you will likely find several other small things that could use your red pen. Click on any of the edit buttons to add, delete or edit anything on the site! Your contributions help make Foodista better!